Who needs Valentine’s Day to take their loved one away for the weekend? You shouldn’t need one special day to want to take him or her away to a romantic city. At any time of year these cities are some of the most romantic destinations in Europe. A great city to spend some quality time with the one you love. 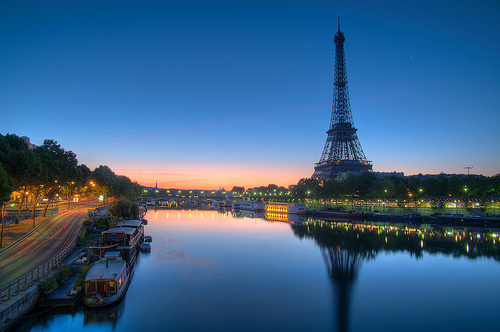 Take them up the Eiffel Tower and watch the sunset, walk through Tuileries Garden, the oldest in Paris on the bank of River Seine created in the 16th century, sit to have a picnic or stop for a coffee and croissant in one of the many café’s. You may also want to take a walk up the Sacre-Coeur Basilica Steps, also visit the Notre Dame de Paris and a must is The Louvre museum, one of the largest in the world and the most visited, houses the Mona Lisa. Don’t forget to go the Paris Opera which shows classic ballets and operas. 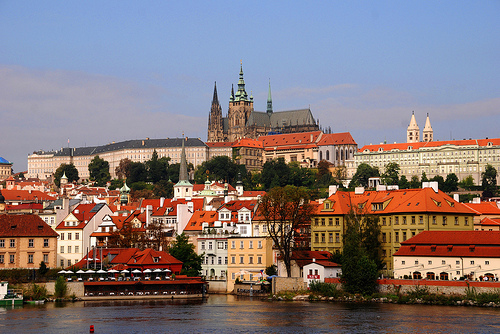 Prague Castle - Photo: Franz St. This beautiful city is one of my favourites, possibly because my partner took me there for a weekend away. We walked up to Prague castle and admired the view of the city, then walked through the royal gardens and sat for a while. Also at the top with the castle is St Vitus Cathedral, which is so beautiful! Within the city we walked through Wenceslas Square, stopped to pick up a coffee and carried on up to the National Museum Steps. It was wonderful just sitting there, talking and watching the people go by. Walking Along Charles Bridge was great fun, about half way along there are steps down to a small square, and just a short distance away is a water wheel. Heading over here you will find a bar fence with hundreds of padlocks on it, with initials and names of people “locking their love” for eternity. It was so romantic! Just around the corner from here you will find the most beautiful sight, John Lennon Wall, you will be able to spend hours reading what people have written. This 117 small islands city just oozes with romance. On leaving the airport you can walk over to the docks and catch a water taxi to anywhere, for which you can actually buy a three day pass. 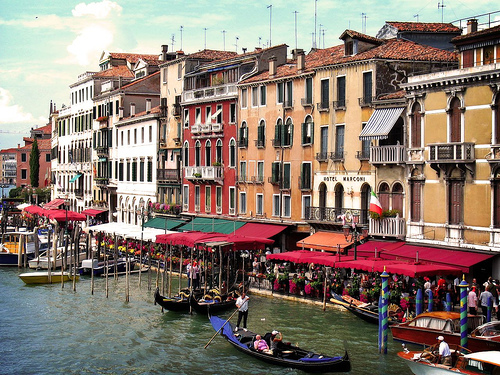 My personal recommendation would be Murano Island as it is much quieter for romantic getaway. A definite must see is the Rialto Bridge, the oldest bridge which offers great views over the Grand Canal, then stop at one of the many small café’s along the river and watch the gondolas go by. One of the best Cathedrals to see if you only have time for one is the Basilica di Santa Maria della Salute. This huge cathedral has magnificent paintings and statues of angels and other religious figures. Head over to St Mark’s Square and see Patriarchal Cathedral Basilica of Saint Mark, which has beautiful marble floors with animals and geometric designs. The upper order is made of gold, bronze and a large variety of stones with mosaic designs. Behind the church is Doge’s Palace with beautiful rooms and décor, and you can also walk across the Bridge of Sighs into the prison cells and see carvings of the people that were kept here. 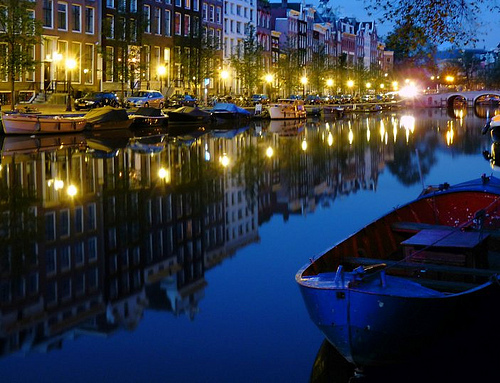 A great city to walk around, Amsterdam has many sights to offer lovers. Visit one of the many museums including the Van Gogh Museum which specialises in the artists work, the NEMO Science museum who’s building looks like a sinking ship and also Anne Frank’s House where she hid from the Nazi persecution at the rear of the building. Walk across the Magere Brug Bridge, the most famous draw bridge in Amsterdam, which looks beautiful at night and walk along the bank of the river Amstel and stop off in one of the cosy coffee shops or restaurants for some romantic time together. 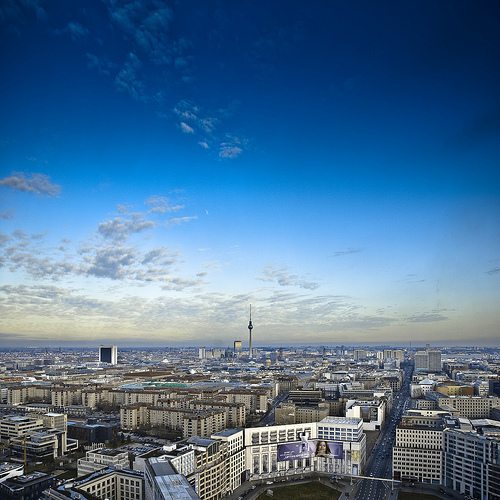 Being Germany’s largest city there are many attractions for you and your loved one to casually stroll through. Here you can enjoy a vibrant and diverse night life, going to some of the many bars and clubs here and dance the night away with your partner close to you. Make sure you go to Museum Island, which is a UNESCO World Heritage Site, located in the dedicated art and antiquities district. A must see is the most visited zoo in Europe, the Zoologischer Garten Berlin, founded in 1844 and home to some of the most diverse species in the world. 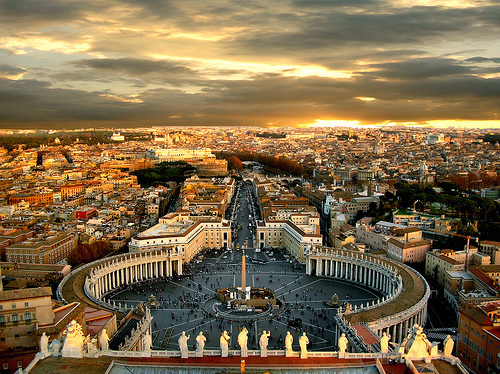 Rome is definitely in the romantic destination category. It’s one of those cities that is bursting with love. There are so many things to do and see that you will have a very fun packed weekend. Visit the Trevi Fountain where legend has it that if you throw three coins into the fountain it will lead to divorce or marriage! (I hope for the latter!). It is also wonderful to visit the fountain at night as it lights up and looks beautiful. You can also walk through the side streets and discover many small unique shops and maybe stop for some lunch or a cup of coffee while watching the people go by. Stroll to the Colosseum and take a tour inside one of the greatest works of Roman architecture then admire the Arch of Constantine while making your way to Palatine Hill. The centre-most of the Seven Hills of Rome, according to the Roman Mythology, it was here where Romulus and Remus were found by the she-wolf that had kept them alive. Enjoy a typical Roman dish, Spaghetti Carbonara and play Lady and the Tramp, share some spaghetti and give your partner a cheeky kiss! The city centre is a World Heritage Site and when you visit you will see why. Most of the medieval architecture in intact so when travelling around the city you will feel like a part of history. 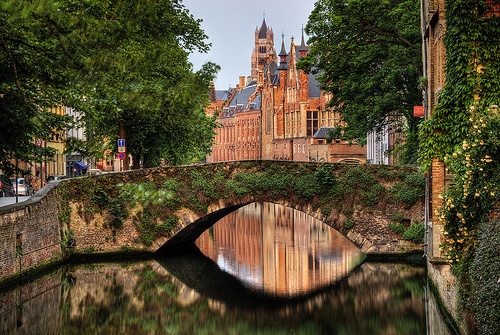 Visit the Belfry of Bruges, the city’s most prominent symbol which was formerly a treasury. You can climb to the top and admire views of Bruges. If you choose to go at the right time, you many be able to have a weekend at one of Bruges many festivals such as September Jazz, BAB-bierfestival (Beer Festival), Summer End Festival or Feest In’t Park, that would be a great weekend for you both to spend together. 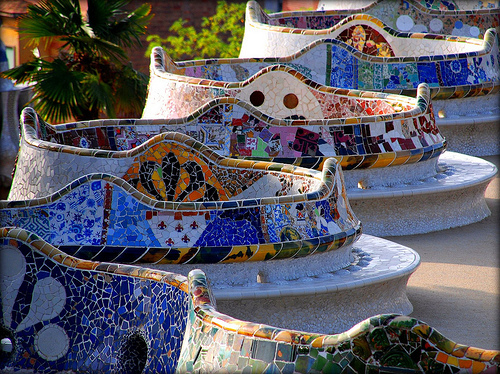 Park Güell - Photo: Franz St.
Barcelona offers a wide variety of things to do for all lovers, from lazing on the beach watching the sunset with some champagne to wild water sports. You will always find something to do in Barcelona. Go on a sailing trip along the Costa Dourrada from Barcelona to Sitges and admire the beautiful views from the water. Once back on dry land there are many delicious restaurants to eat in. Why not take some time to do a spot of shopping? Or why not go to Aqualeon, a safari and water park where you can see many animals such as tigers, elephants, lions and gazelles; and you can enjoy the dolphin shows, stroll through and admire tropical birds and even take a dip in one the many large swimming pools. Regarded as one of the most beautiful cities in Europe, Budapest is definitely one to see with your loved one. 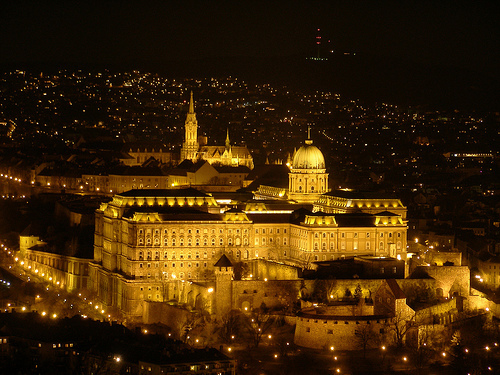 It has some of the World’s most beautiful Heritage Sites including Buda Castle which was completed in 1265, on the southern tip of Castle Hill. Hero’s Square which is dedicated to the Seven tribes that founded Hungary and is surrounded by the Museum of Fine are and the Palace of Art, which are also worth a visit. Enjoy the largest thermal water cave system in the world, Szechenyi Thermal Bath, which can be found in City Park, built in 1913, see the second largest synagogue in the world named Dohany Street Synagogue, which seats 3000 people and the third largest parliament in the world. The Hungarian Parliament building is one the oldest buildings and a notable landmark in Hungary, it is beautiful at night so you must go and take a look. There are some wonderful romantic sights to see in Copenhagen. Visit the Winter garden at Glyptoteket, which houses one of the most extensive collections of sculputres from Danish, French and ancient art. Spend a night at the Opera, by having a romantic dinner and watching the sun set and city light up. Head to Tivoli Gardens, which is the heart of Copenhagen and has many flowers of all colours of the rainbow and many benches for you to sit down and share a kiss. The final recommendation is to go to The Baroque Park, where you can stroll among the fruit trees and fountains and every Sunday afternoon, live jazz and classical music is played. The perfect end to the weekend. So you have no excuse to not take your loved one away when there are so many attractions throughout Europe. What do you think Europe’s most romantic cities or destinations are? Make a comment and let us and everybody know. Berlin’s an interesting choice. Great city, but I always found it more edgy and interesting than romantic. How about Lisbon or Santiago de Compostela? All beautiful cities! But I have to give Paris the nod for most romantic, and Rome a close 2nd. Oh! But then there is Venice? Wow, tough choice. I don’t think Berlin and Rome would be on my list but Prague and Bruges, definitly. I’d be inclined to add Tuebingen, Germany and Vienna. I’m glad Amsterdam made the top 3. I don’t know if it’s the canals and the way night lights are reflected on them but there’s just something about this city that makes you want to fall in love all over again. Rome is something too – if you take two seconds to realise how lucky you are to be in that city with your loved one, you’ll have the best day of your life. And the bustle of Paris takes away the romantic fiber in me – too many honks and poop. 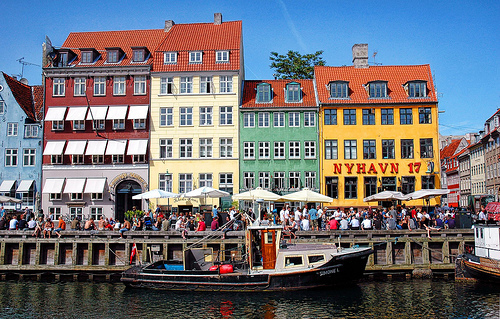 Copenhagen is a strange choice for a romantic city. Heidelberg and Edinburgh are very romantic spots.